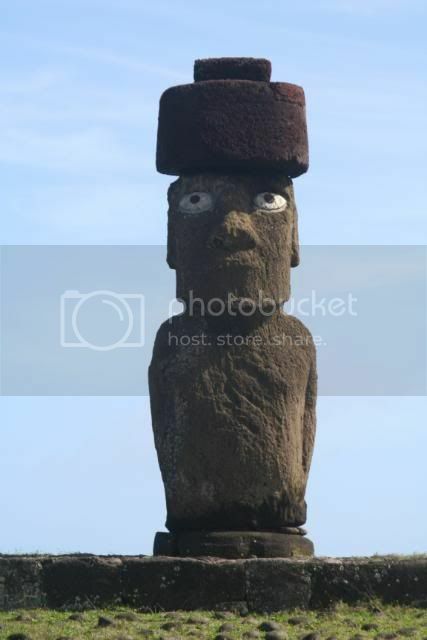 I have only recently joined this forum and have spent the last few days reading as a way of avoiding the reality that my present project is driving me nutty. It has been reinvigorating, seeing all the ways that experienced shop pros get things done in amazingly simple ways. Any one can make it look hard. A real pro can make it look easy. By putting as many of these invaluable tips as possible in my head, some of it pops out when it is needed. 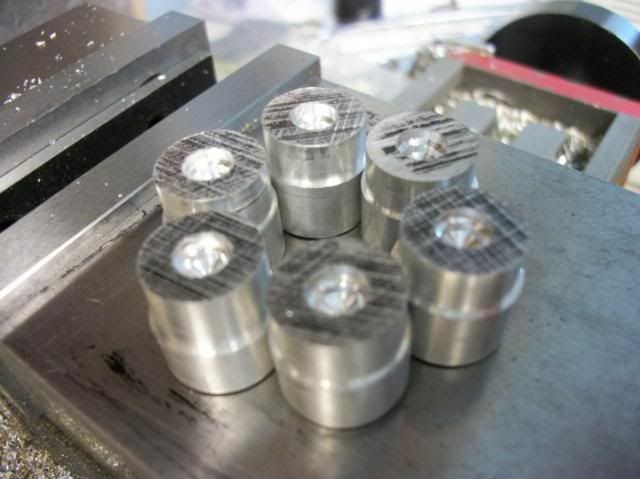 This method of making pistons is certainly the result of combining other peoples methods and reaching a different end. I don't have much aluminum bar stock so when I needed to make some pistons, I started with a piece of 1/2" thick plate about 2" x 2". Lacking a power hacksaw or bandsaw, I chopped it into small chunks about 7/8" x 7/8" x 1/2" using my table saw. No pictures of the process but here is the result. 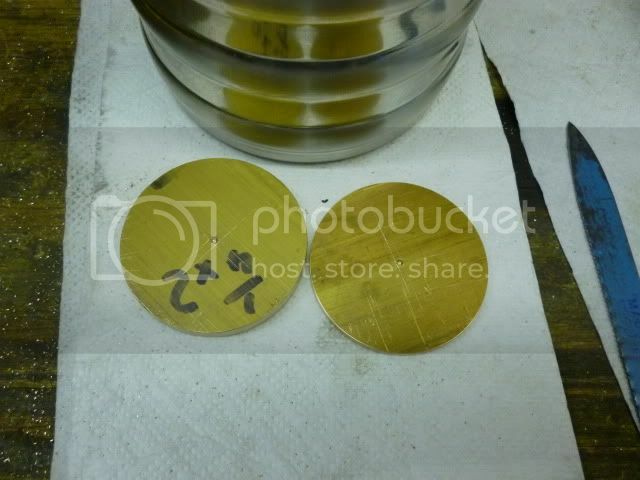 Each piece has been marked and a 1/4" dia x 1/4" deep hole drilled in the center of one face. 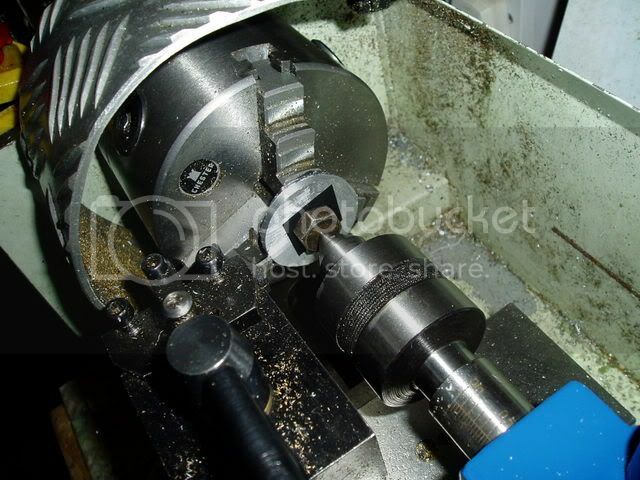 This face will become the bottom of the piston and the final machining of this face will be determined by your specs. For now, it will be used to position the blank on the lathe. A piece of 1/4" dia rod is set up in the 3 jaw chuck with about 1/2" protruding from the jaws with the jaws only barely tight. Over this is placed a small square of hardwood about 1" square and 1/4" thick with a 1/4" hole in the center. 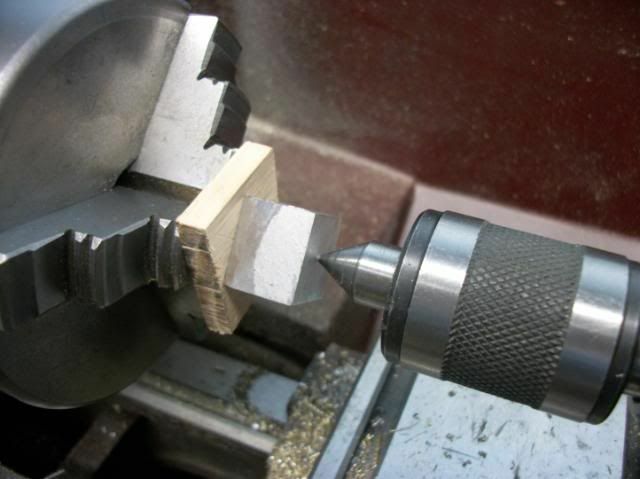 I used Red Oak that is readily available at home building supply stores in the U.S.
One of the aluminum piston blanks is fitted over the rod to position it and the tailstock with live center is brought up to bear on the unmarked face. A fair amount of force is used to press the blank against the hardwood. Now the 3 jaw can be snugged up but it doesn't need to be very tight. The grip is provided by the friction of the aluminum against the hardwood face. This is an adaptation of the method that was shown by Bogstandard in his post on making a flywheel. 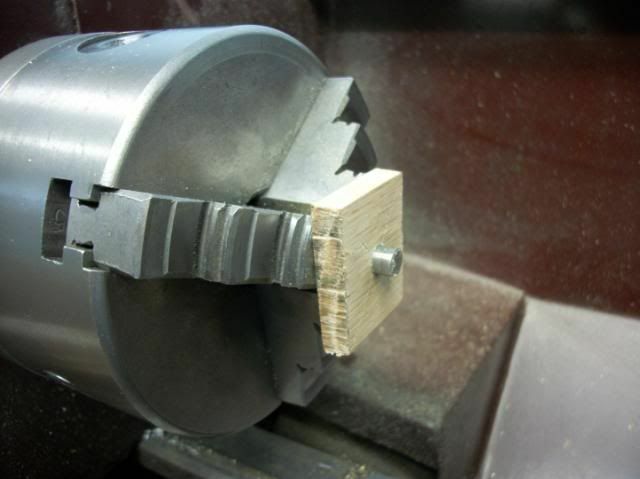 By using the hardwood face, it is possible to turn diameters less than the face of the chuck jaws without hitting the jaws with the tool. The cut continues past the end of the workpiece, into the wood. I think it provides a better friction grip than two sided tape and leaves no residue to be cleaned off afterward and can be used for multiple pieces as done here. This operation is working very close to the chuck so be very careful to check for clearances. I recommend manual advance of the cut for two reasons. 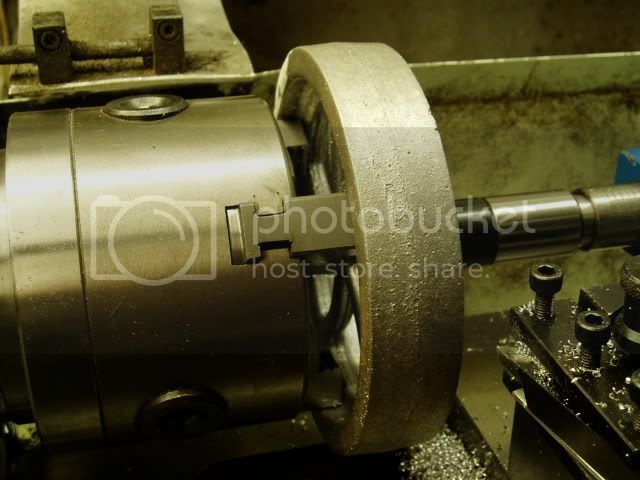 First is the very close proximity of the chuck and second is the possibility of the workpiece slipping on the wooden face. This is not a problem if you are advancing the cut manually but it using power feed, bad things will happen before you can stop it. On this job friction is more than adequate. 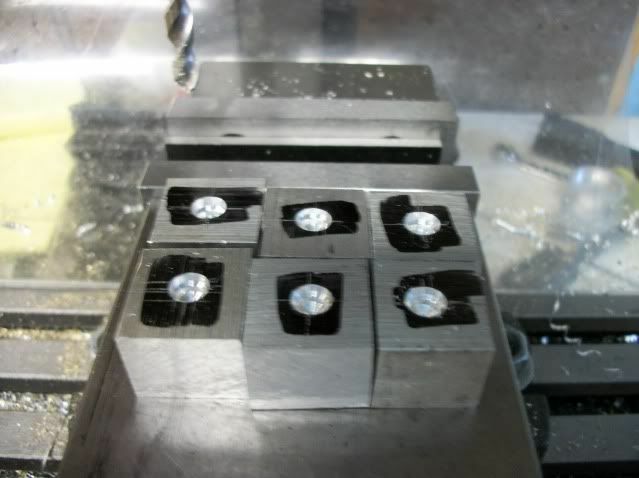 In fact, the workpiece will go from square to full round in one pass. Watch this video. By making the cut in one pass, without moving the crossfeed, all six pieces come out to the same dimension with a high degree of precision. The diameter is greater than the required finished part but the dimension is not critical. 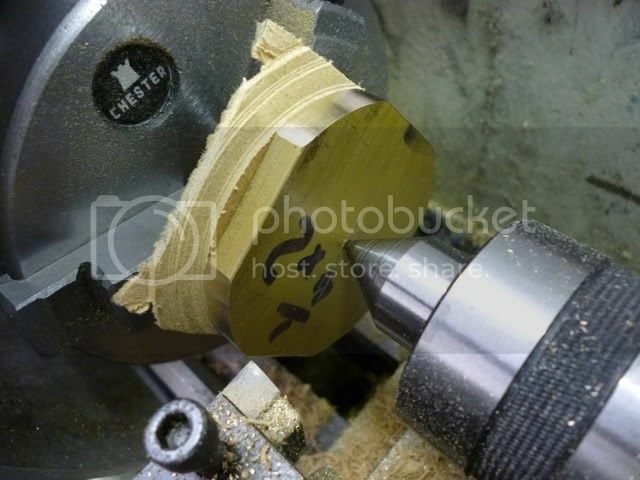 One of the pieces is then returned to the lathe or the last piece is just left in the lathe. 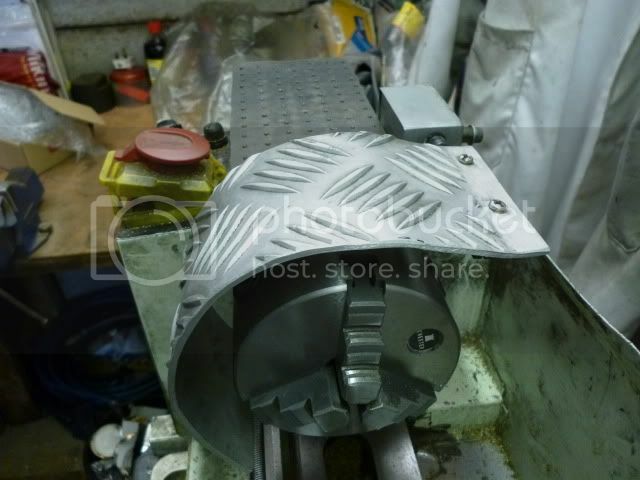 Then, using whatever method you prefer, sneak up on the final dimension carefully and the lock the crossfeed to maintain that final depth of cut. One piece done. 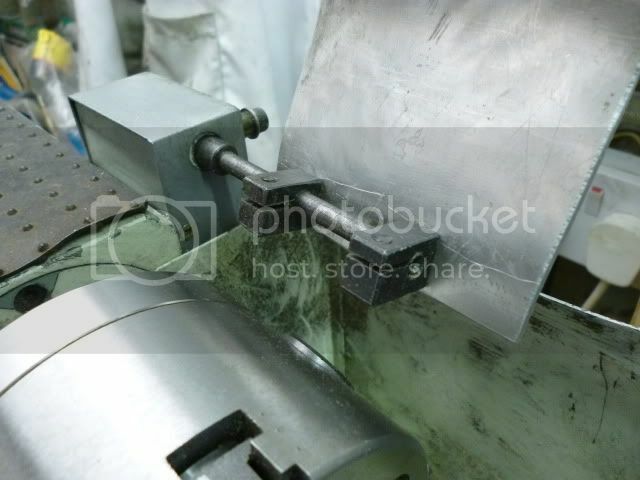 Replace it with one of the other oversize pieces and turn it to final diameter in one pass. Second piece done. Repeat four more times. Six pieces done. 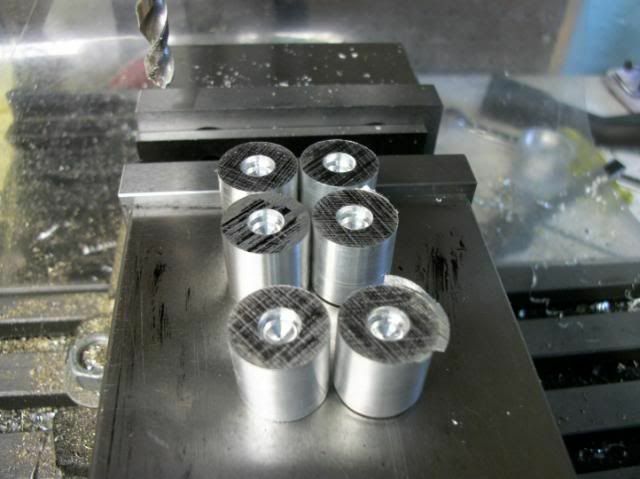 If your tool is sharp and your lathe at all rigid, since you did not change the depth of cut you should have six pieces to the same diameter within .0005"
The pistons in the last photo have a step turned after all six had been turned to the finished diameter. This is peculiar to my project and the concentricity of the step is less critical so I had no problem removing and mounting to the wooden chuck. My pistons will have a ball joint instead of a wrist pin so your on your own from here. The 1/2" thickness was all i needed for my project but I would be comfortable using this method with 1" or more of thickness. It works for me. I hope it helps you. Never thought of using wood as a drive medium! I have lots of pieces of thin ply to play/ experiment with. Thanks! 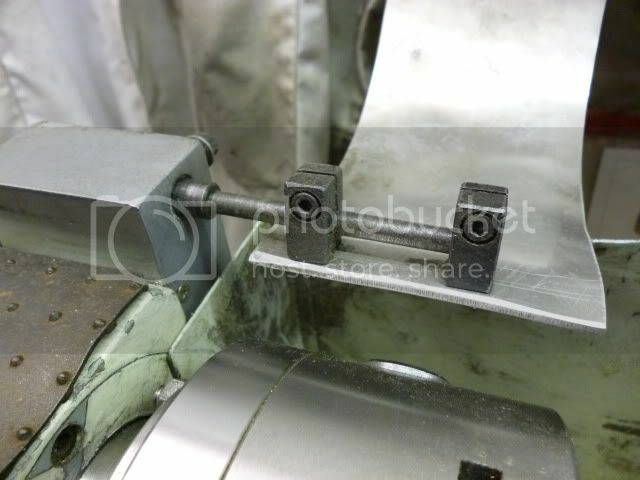 Thats a neat idea using the wood for the friction drive, that ones filed away in the memory bank. Great idea with the wood plate. I definitely need to remember this one. This is a good idea! I hope I can remember it long enough to use it. To save putting a lot of strain on the point of the centre and / or marking the work, stick a small ball race in between the centre and the work. Helps spread the load and also allows you to use a thinner normal dead centre so you can get closer in. Sorry, I do not have a clear photo handy. But I could take more later, if you need any. Yes please - pics of the guard would be greatly appreciated. There is great info on this thread! !